As the temperatures continue to hover in the mid-20s at night, it's becoming harder and harder to drink ice cold gin cocktails. I made a heroic effort this past weekend, Winter Storm Electra notwithstanding. Even so, there are freezing Manhattan nights when I would much rather sip warming spirits and drinks. And while I've lately taken an interest in bourbon, there is absolutely no reason to call for a moratorium on gin consumption over a snowflake or two. The intelligent thing to do is to drink heated cocktails like this spiced apple cider. Plus, sipping my gin out of a mug has a certain Prohibition feel to it and reminds me of much loved cocktail bars like The Back Room on the Lower East Side. The nice thing about this spiced cider is that it pairs well with both gin and bourbon but it can also stand on its own without any alcohol at all. Reducing the cider for an hour -- a brilliant move from Bon Appétit -- results in a syrupy, concentrated apple flavor. No additional sweetener is necessary but a little maple syrup accentuates the spices and rounds out the flavors nicely. It's pretty respectable on its own, actually. The gin of choice here, Martin Miller's Gin, came to me sort of randomly when the lovely folks at the Reformed Spirits Company in the UK generously offered to send me a bottle to sample. 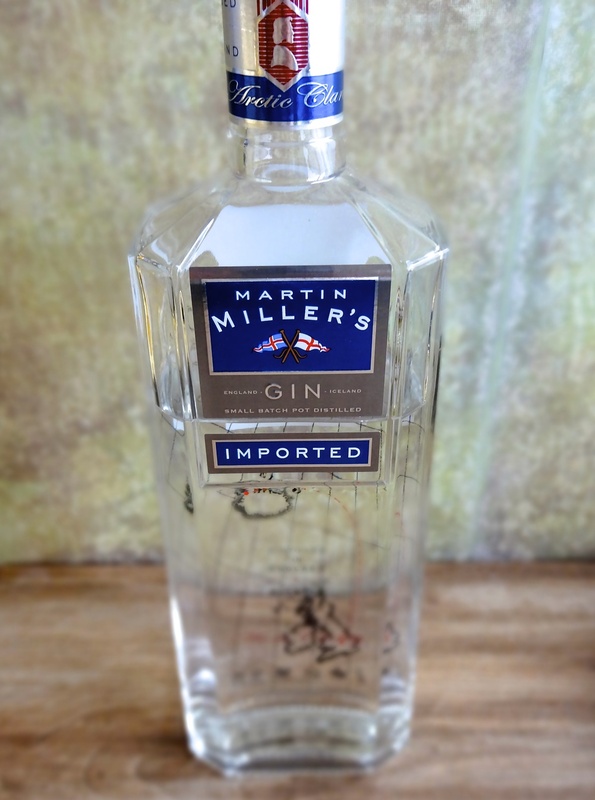 As a self-described gin connoisseur, I was more than a little surprised and incredibly embarrassed to admit that a) I had never tried Martin Miller's Gin before, and b) I had never even heard of it. But I love clean, clear spirits and this is one of the better ones out there. Martin Miller's Gin combines pure Icelandic spring water with the traditional juniper, coriander, and angelica, plus an assortment of less common botanicals and citruses such as cassia, cinnamon bark, liquorice, Seville orange peel, lime rind, and cucumber. Their gin is packaged in this stunning crystalline bottle that begs to be placed on display. The most surprising quality about Martin Miller's Gin is how well it pairs with apple and warming spices, probably owing to the addition of cinnamon bark. It provided the inspiration for this soothing, comforting cocktail. Hope you give it a chance. Stay warm out there. Cheers! Combine the cider, cinnamon, orange peel, nutmeg, allspice, and clove in a small pot over medium heat. Split the vanilla bean lengthwise and scrape out the seeds. Add the seeds and the vanilla bean to the pot. Bring the cider to a simmer over medium heat but do not let it boil. Reduce the heat to medium-low and cook, uncovered, just below a simmer for about 1 hour. Strain the cider through a fine-mesh sieve into another pot or bowl and discard the solids. Sweeten with a little maple syrup, if desired. Add gin (or other spirits). Serve in large tea or coffee mugs with additional cinnamon sticks, vanilla beans, or citrus slices for garnish. Note: Use a thick, dark, good quality apple cider -- I like Red Jacket Orchards' plain apple cider. For a slightly different flavor, try a nice pear cider. You may also substitute other spirits, such as bourbon, or other brands of gin. When preparing the orange peel, remove as much of the bitter white pith as possible or it will leave a bitter taste in the cider. Also, feel free to substitute whole spices for the ground allspice and clove. Fall is officially here and it seems to have brought with it a succession of perfectly crisp, sunny days -- at least in New York. Even though I'm increasingly reaching for scarves and sweaters, I also know that this is the season of walks in the park under brightly colored leaves, morning yoga classes, almond milk lattes sprinkled with nutmeg, and quiet creative projects. The arrival of fall also marks the beginning of apple season at farmers market. Wooden crates of beautifully sweet and slightly tart apples are now everywhere and if you're an apple lover (and I am), this is an exciting development. Biting into them fresh is my preferred method of consumption but a freshly baked apple dessert or pastry is more than tolerable. I have to confess that I'm not the world's greatest baker. Baking is a very exact, very precise science, and I've always felt more at home with the improvisational, experimental nature of cooking. But I'm actually pretty adept at baking muffins -- a muffin savant. (One could argue that being only good at baking muffins is the very definition of an unskilled baker.). The only real muffin wisdom I've picked up over the years: always use oil instead of butter and do not overwork the batter. All of this brings me to my current favorite muffin recipe. 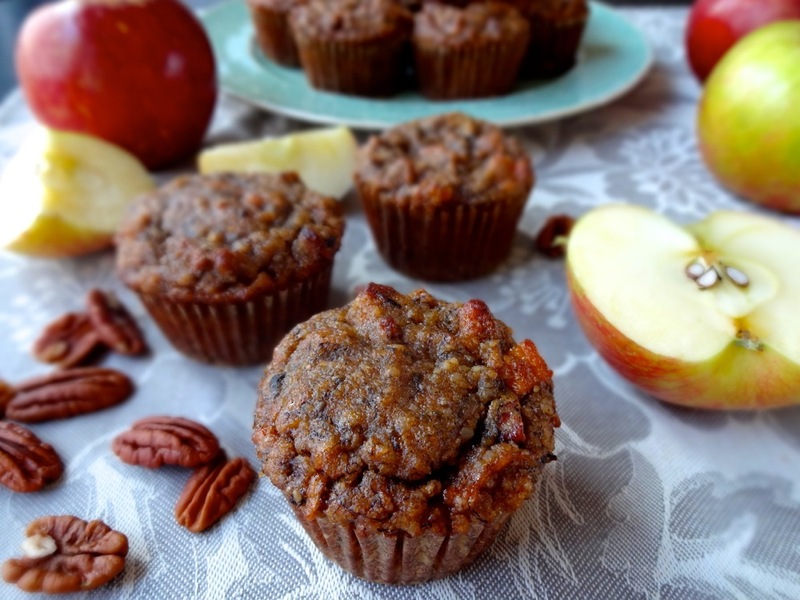 As someone who eats her fair share of gluten-free (GF) baked goods, I can say, without reservation, that these are the best GF muffins I have come across. (The muffins are also dairy free but not vegan due to the inclusion of eggs). Not only do they come out of the oven perfectly moist and soft, they remain so overnight and freeze/unfreeze well. They're fragrant, lightly spiced, and not too sweet. 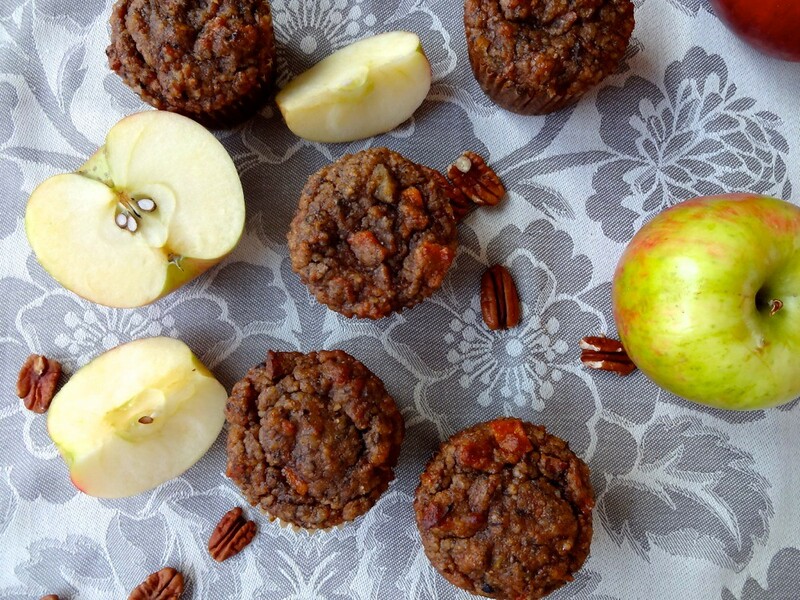 Mostly, they're a simple, delicious way to celebrate apple season. Preheat the oven to 350 degrees F and line a muffin tin with paper liners. In a bowl, whisk together the almond flour, baking soda, and salt. Roughly chop the walnuts and dried mangoes. Peel and grate the apples using a coarse grater -- do not use a food processor -- and set aside while you prepare the wet ingredients. Mash the bananas with a fork. In a large bowl, whisk the eggs to break them up and add the oil, apple cider vinegar, vanilla, cinnamon, pumpkin pie spice, and the mashed bananas. Stir everything well. (You can also do this in a blender). Gently incorporate the almond flour, walnuts, dried mangoes, and chia seeds into the banana mixture. Squeeze out the excess juice from the shredded apples and stir the apples into the batter. Try not to overwork it. The batter should be fairly wet at this point but if it's too wet, add in another 1/4 cup of almond flour.Allow the batter to rest at room temperature for about 10 minutes to allow the chia seeds to absorb the liquid. Spoon the mixture evenly into the lined muffin pan, filling each liner to the top (they do not rise much). They will stay fresh wrapped in plastic on the counter for a few days. For long-term storage, wrap the muffins individually and store in a freezer bag for up to 1 month. Notes: Leftover almond flour should be stored in the freezer. 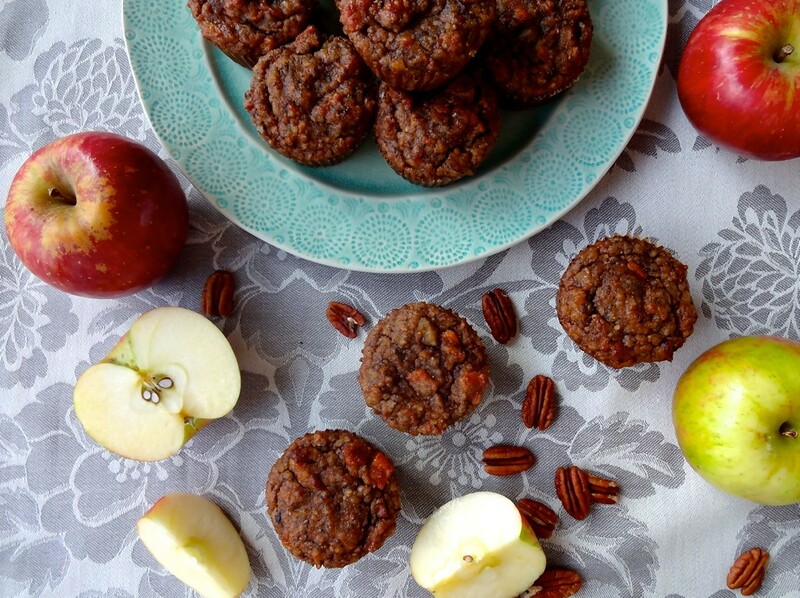 If mangoes or walnuts are unavailable, feel free to make substitutions (get creative!). If you do not have coconut oil, substitute other neutral tasting oils (or even olive oil) but not butter. This is a very soft batter so the paper liners are necessary - try not to omit them. For a moist texture, the key is to not over bake the muffins - start checking them at the 17- or 18-minute mark and make sure that they do not dry out. It's July and we're playing with fresh ripe peaches. Today, in smoothie form. Smoothies are a little obsession of mine. Even in the height of this insane juice craze, I think there is a solid place for blended drinks. There actually seems to be quite a lot of unnecessary smoothie vs. juice debate. Personally, I consume both and do not believe you should ever have to choose between the two as long as you incorporate them in ways that best serve you. A smoothie can be a standalone meal. A juice, on the other hand, because it's not as filling, is better used as a component of a meal or a healthy snack. In a smoothie, you're consuming the whole fruit or vegetable, with its fiber intact. The juice is processed and stripped of fiber so it may not keep you full for very long. (That is actually a considerable advantage to drinking smoothies - whole foods are generally preferable to processed foods. And fiber is great -- why throw it away?). As a breakfast item, smoothies have another, and to some people, more important, advantage: time and convenience. Unlike juices, smoothies can be prepared ahead of time and stored for later. They do not oxidize as quickly as juices. I typically make a smoothie the night before and store it in the fridge overnight. (Juices should not be stored. Unless you're lucky enough to own a cold press juicer, drink your juice within 15-25 minutes of making it to preserve its enzymes.). 1. No dairy. Don't worry - I'll take care of you. We will use a frozen banana instead, which gives you that smooth, creamy mouthfeel that you would otherwise get from dairy (but I bet you already knew this about frozen bananas). 2. No ice cubes. Ice will just dilute the flavor, especially as it starts to melt. Bon Appetit concurs: How to Totally Screw Up a Smoothie. For a chilled smoothie (and you will want it chilled), some frozen fruit is a much better option. You will need the fruit anyway. I usually add a frozen banana (see no. 1) but frozen cherries, mangoes, and pineapple are all great choices. As for the ingredients, it's all pretty straightforward. Try not to leave out the turmeric. It's good for your skin and, curcumin, an antioxidant flavonoid found in turmeric, has been shown to have anti-inflammatory effects. You probably have some lurking around in your cupboard - put it to work. Blend all of the ingredients together, start with veggies and lemon juice (with minimal water or coconut water or even fruit juice) to get everything moving, followed by fruit and grated ginger. Add the frozen banana last and blend everything until smooth. Parsley Variation: Because I find pure fruit smoothies to be a little too sweet for my tastes sometimes (especially in the morning), I like to add greens. Same as above but add 1/2 cup chopped organic parsley (or other herbs).